Owl Ridge Alpacas: Blog: Picking up "Beans"
Hate to admit it, but there are times the bean piles get away from us. With both my husband and I working full time off the farm, two active kids, 19 Alpacas, horses, chickens, etc. we often run out of time. I know I'm not alone in this one! 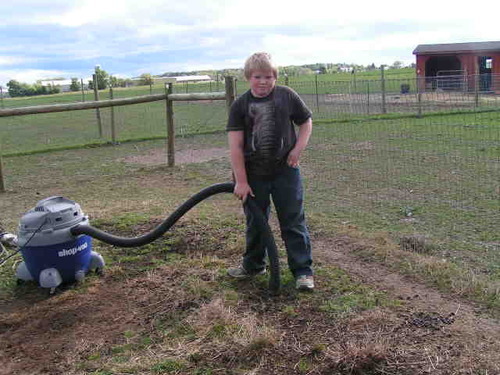 Thankfully a fellow Alpaca breeder told me to try a "Shop Vac." We have a couple and thought - why not! Turns out they work like a charm - especially when your kids think it's fun! Couple of things to remember - don't go to fast or the beans will clog up the hose (not fun to unclog); and the drier the beans the better. It will make quick work for those times your bean piles get away from you. Have to wonder if the company ever thought their product would be picking up beans!